#2032 "Windy Wet Ridge Overlooking George Lake"
The 2017 Southampton Art School Annual Adventure was carrying on the legacy of my friend and artist Jane Champagne. This was the eighth demonstration painting and the first one of Day 3 of the Plein Air Paint Out. We had long anticipated the passage of the cold front and the two or three hours of stratiform rain which typically follows such a squall line. So we shifted our painting day back a couple of hours. I still arrived early at Killarney Provincial Park after having made arrangements with the Ranger the previous afternoon. They knew that we were coming and that Campsite 77 was our destination. I had a good start on my demonstration piece by the time they arrived. They had maps and directions to Campsite 77 but I had hung my pale and pigment stained painting shirt on a tree limb by the access point. I thought that my shirt would be a unique sign in order to make it easier to find our painting location. 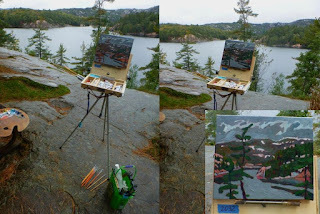 It was still spitting rain and even though I had coated the canvas with linseed oil, the paints were still sliding around. The morning was very windy and wet in the cold advection behind the cold frontal trough. We had come to Killarney to paint though and a little inclement weather was not going to deter us. This is the view looking northwestward from the cliff across the basin of George Lake and to the quartzite mountains of La Cloche in the distance. #2031 "Dead Pine High Rise"
The 2017 Southampton Art School Annual Adventure was carrying on the legacy of my friend and artist Jane Champagne. This was the seventh demonstration painting and the fourth of Day 2 of the Plein Air Paint Out. After completing #2030 "Setting Down Some Roots" I moved eastward across the point to this vantage overlooking the shallow bay on the east side of Lighthouse Lake. Dale was with me still but the other artists had either gone for walks or were painting along the gravel road. The wind was still howling. The cold frontal trough was getting closer. We needed to paint as much as we could within the warm sector of the storm because conditions were going to be quite different in the wake of the cold front on Wednesday. I was attracted to this pair of white pines on the eastern edge of the point. The wood pecker holes in the standing dead pine reminded me of an apartment building. There were four units stacked in the vertical. Only the top hole was round. The other entrances were almost square and I puzzled as to who or what might have shaped them that way and more so, why? I suspect that the square holes were the work of a Pileus or Pileated woodpecker. The scientific name is Dryocopus pileatus, which means crested tree-hitter. The somewhat silly debate about how to say the name of this fascinating bird comes up with two solutions. Sources imply PIE-lee-ay-tid is correct and more common but "Pill-ee-ay-did" is also accepted. The southwesterly winds were blustery in advance of the cold front. 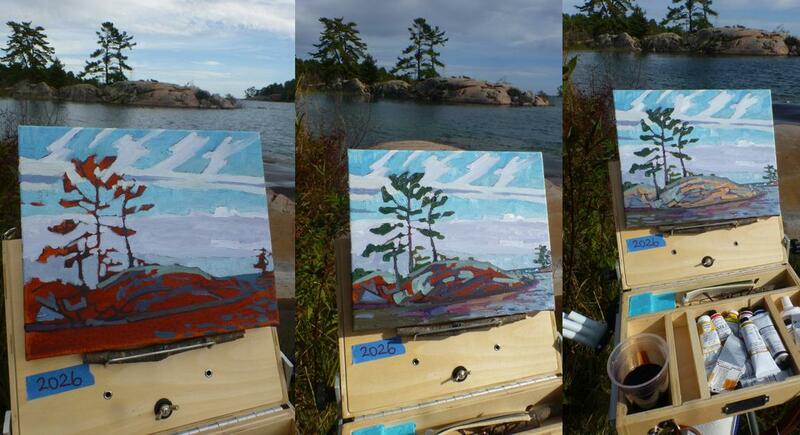 The frontal cloud was still some distance away so the plein air weather was still perfect. I first heard the thunder from the cold frontal cumulonimbus at 4 am the following morning. The rain arrived about an hour later. 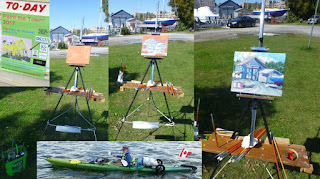 The morning plein air session was going to be delayed a bit but we would still get in almost a full day of painting. #2030 "Setting Down Some Roots"
The 2017 Southampton Art School Annual Adventure was carrying on the legacy of my friend and artist Jane Champagne. 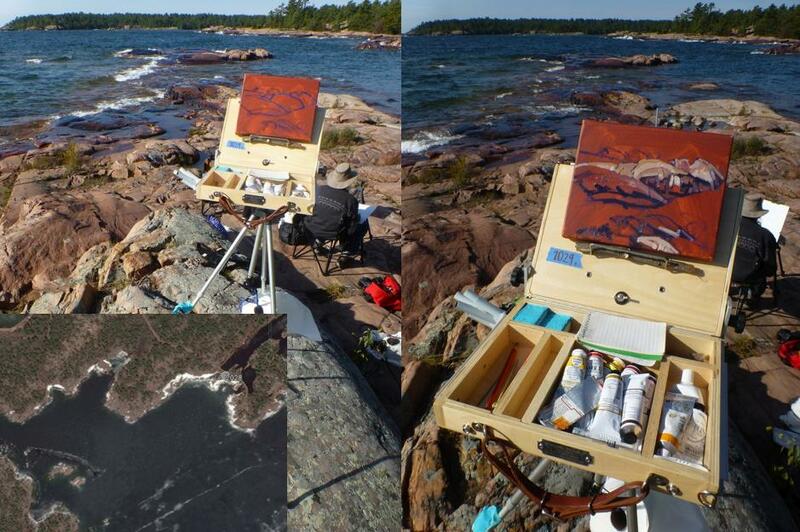 This was the sixth demonstration painting and the third one of Day 2 of the Plein Air Paint Out. After completing #2029 "Killarney Red Rocks" I crossed to the north side of the gravel road leading to Killarney Light looking for something interesting to paint. That is why both chickens and artists cross roads - for something completely different. The artists had scattered with the wind but remained in the general area. The warm sector gales in advance of the cold front were howling and it was more comfortable to paint in the lee of some protection. I had to take long strolls to visit them all. Two intrepid participants watched this demonstration piece from start to finish. They saw me do things that I had not yet explained and that I did somewhat automatically anyway. The roots of this ancient white pine snaked over the Killarney granite searching for nutrients and moisture. Countless feet had trod on those roots and worn off the protective bark. The tree had to be as old as the Killarney hills but it's true age was unknown. Fresh life was emerging from a protective crook in the root. New life emerges from the older generation even in the most unlikely circumstances. I hoped that this tiny white pine would survive. Lighthouse Lake may have surrounded this point but that water was not available to the ancient tree or its sibling offspring. Everyone needs to put down some roots in order to be safe and to survive. The 2017 Southampton Art School Annual Adventure was carrying on the legacy of my friend and artist Jane Champagne. 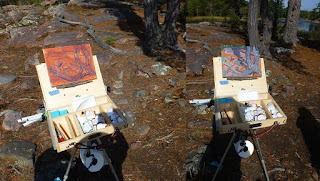 This was the fifth demonstration painting and the second of Day 2 of the Plein Air Paint Out. 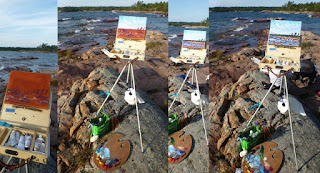 After completing #2028 "Windy Red Rock Bay Morning" I focused my gaze on a grouping of large red shoals just in front of me. I didn't have to move a bit. I wanted to stay very close to the participants so that I could share suggestions while still let them see what I might be doing. Learning is an interactive process and it goes both ways. Rocky ledges like this one would have been dangerous for canoes in Shebahonaning. Shebahonaning was Killarney's original name and means "safe canoe passage" as long as you do not venture into the rocky shoals of Lighthouse Lake. It was windy enough to turn several large boats back into the shelter of Killarney Channel. These boats charged out into Georgian Bay with large motors hanging off the transom only to return a short while later to the relative shelter of Shebahonaning. The swells and waves in the exposed southerly fetch were boiling around the rocky shores and shoals of Red Rock Bay. #2029 "Killarney Red Rocks" on Pixels.com. #2028 "Windy Red Rock Bay Morning"
The 2017 Southampton Art School Annual Adventure was carrying on the legacy of my friend and artist Jane Champagne. 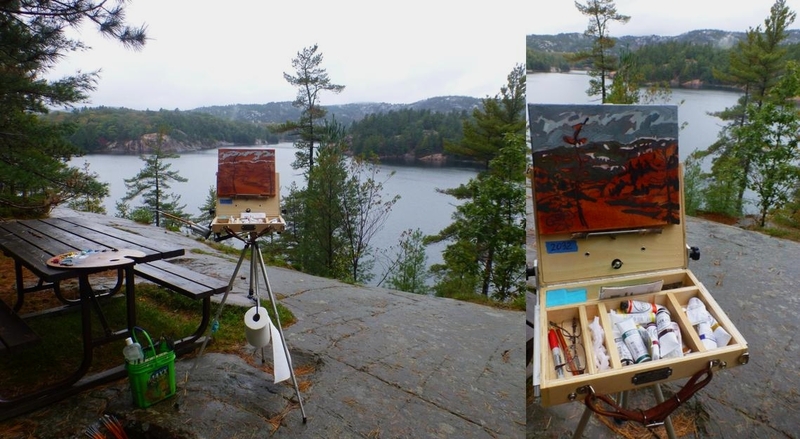 This was the fifth demonstration painting and the first one of Day 2 of the Plein Air Paint Out. The southwesterly winds of the warm sector of the storm were still blowing on Tuesday morning. The cold front was due to arrive early on Wednesday morning. 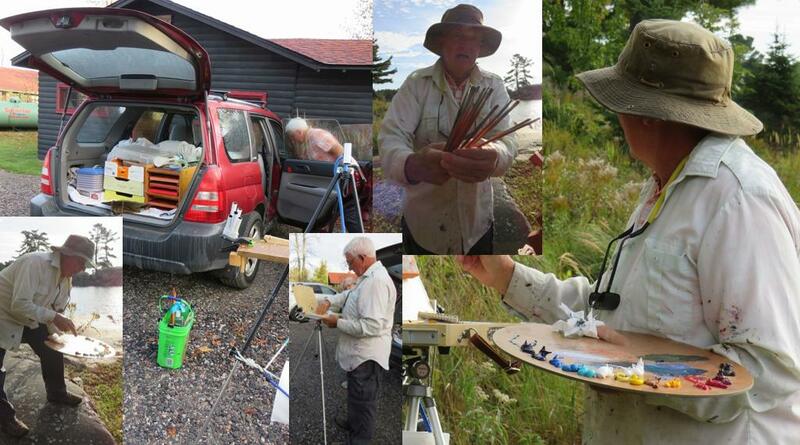 It was a fine day to paint as hard as we could before the wet weather and cooler temperatures arrived. This is the view looking southwest from just south of the gravel road leading to Killarney Light located on the tip of Red Rock Point. . The distant shore is the far shore of Killarney Channel with its cottages on George Island. The shore to the right is called Thebo Point. The area was named after the town of Killarney in Ireland. The area was first settled in 1820 by French Canadian fur trader Étienne Augustin de Lamorandière and his Anishinaabe wife Josephte Saisaigonokwe, who established a trading post named Shebahonaning (safe canoe passage) at the townsite. Killarney was operated as a fishing camp by the Fruehauf Trailer Company in Detroit, Michigan. Roy Fruehauf, president of the company from 1949 to 1961, was primarily responsible for operating Killarney. Clients and guests would be flown in via Mallard sea planes for vacations during the warmer summer months. #2027 "Killarney Channel Eastern Entrance"
After completing #2026 "Killarney Point Flagged Pines" I headed up to the higher granite mound east of the Pilot House in order to paint with another participant. In addition I turned my easel clockwise another 25 degrees thus keeping the afternoon sun still on my right shoulder. The 2017 Southampton Art School Annual Adventure was carrying on the legacy of my friend and artist Jane Champagne and this is something Jane would have done. This was the fourth demonstration painting and I wanted to reinforce the truth that subject matter and inspiration were everywhere. These four paintings were like a record of the sundial for the day. This view from the Pilot House rocks was toward the southeast and across the shallow shoals and the point that formed the southern edge of Killarney Channel. The waves were crashing across the submerged shoals and the granite shore of the eastern point of George Island. The Entrance Rocks were the closest to me with Pancake Rock in the distance. It was really windy in the exposed southeasterly flow off Georgian Bay. The artists of the 2017 Southampton Art School Annual Adventure were relatively protected from the buffeting wind. At times it was still a challenge to keep the easel from blowing over and the palette was sometimes thrust toward your chest. I almost had a positive imprint of the palette colours on my paint shirt more than once. The waters of Shebahonaning were like relatively calm compared to those of Georgian Bay and the inland sea. Killarney's original name was Shebahonaning and it means "safe canoe passage". #2026 "Killarney Point Flagged Pines"
After completing #2025 "Killarney White Pine" I simply turned my easel clockwise another 25 degrees thus keeping the sun on my right shoulder. The 2017 Southampton Art School Annual Adventure was carrying on the legacy of my friend and artist Jane Champagne and this is something Jane would have done. This was the third demonstration painting and I wanted to reinforce the truth that subject matter and inspiration were everywhere. 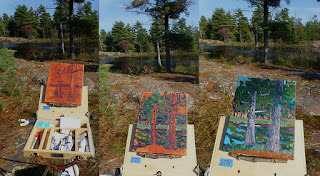 I had painted these trees and granite point before. #0840 "Killarney Rocks!" and #0914 "Mourning Granite" while #0915 "Killarney Point- The Phlip Side" reveals the other side of the rocky point. 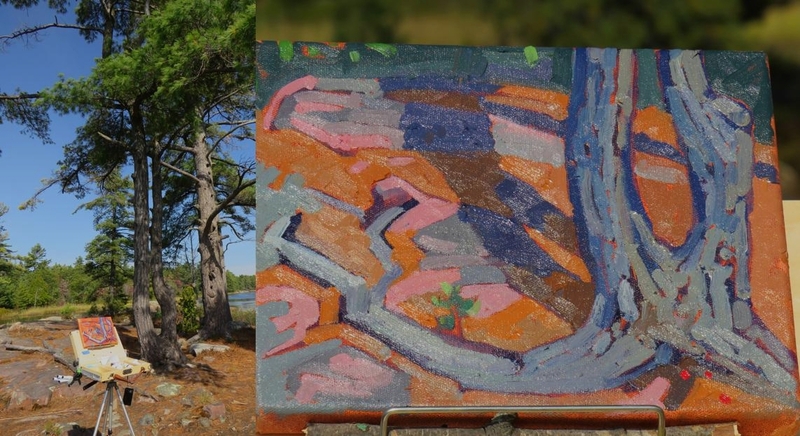 There are probably other paintings as well of this important Killarney landmark located at the eastern entrance to Killarney Channel. The waters of Shebahonaning were like rough. Killarney's original name was Shebahonaning and it means "safe canoe passage"
The cirrus cloud revealed the location of the jet stream and foretold the wet weather that was on the way. Note the cumulus towers poking upward from the band of altostratus. These are called altocumulus castellannus and are essentially towering cumulus based in the free atmosphere. The water level was higher than in previous years. The 2017 Southampton Art School Annual Adventure was carrying on the legacy of my friend and artist Jane Champagne. This was the second demonstration painting and I wanted to illustrate that subject matter and inspiration were everywhere. There is no need to travel to the south of France. 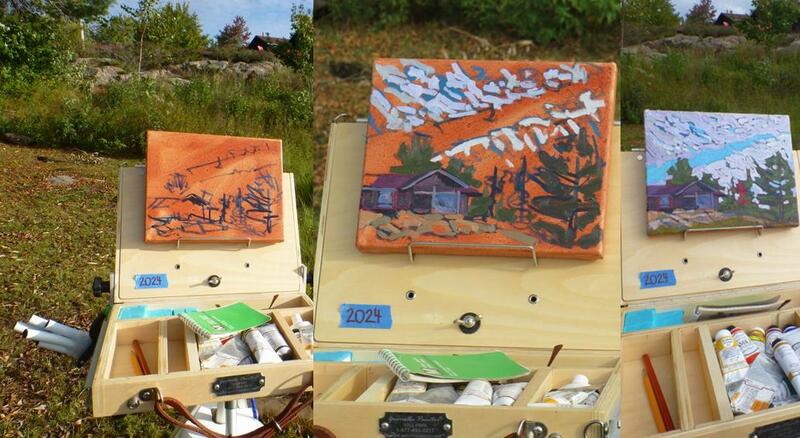 I started this painting within minutes of completing #2024 "Killarney Mountain Lodge Chalet". Sometimes these demonstrations are more instructive and empowering than words. 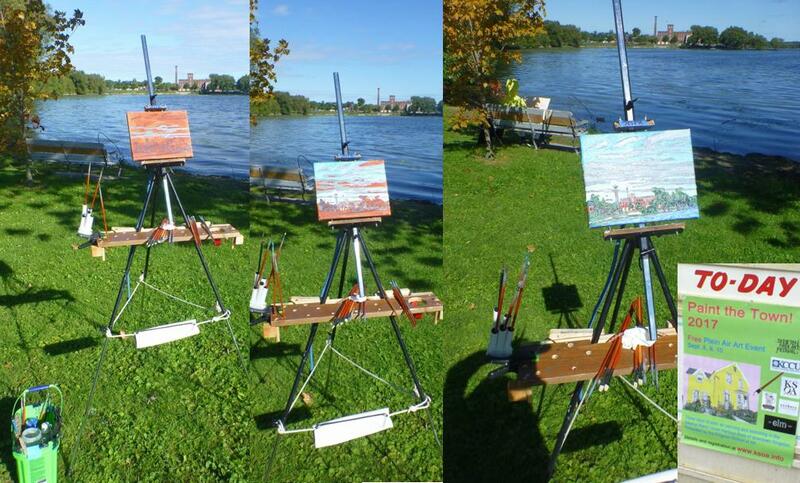 I simply turned my easel clockwise 25 degrees thus keeping the sun on my right shoulder. This view is looking northeastward along the edge of the little bay in front of the Killarney Mountain Lodge Chalet which was the premium accommodation in the time of Maury and Annabelle East. The large crane was still busy filling in the wetland which would become the site for the planned convention centre. 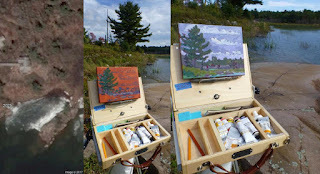 I did not include the crane or construction in my painting but focused instead on the white pine and the skyscape. Cumulus had developed with daytime heating in the low level cold conveyor belt of the approaching autumn storm. The convective temperature for the chilly air mass had been reached. . The easterly winds are revealed in the shapes of the clouds. This painting may be named after the dominant tree in the composition but it is really all about the weather. #2024 "Killarney Mountain Lodge Chalet"
The 2017 Southampton Art School Annual Adventure was carrying on the legacy of my friend and artist Jane Champagne. 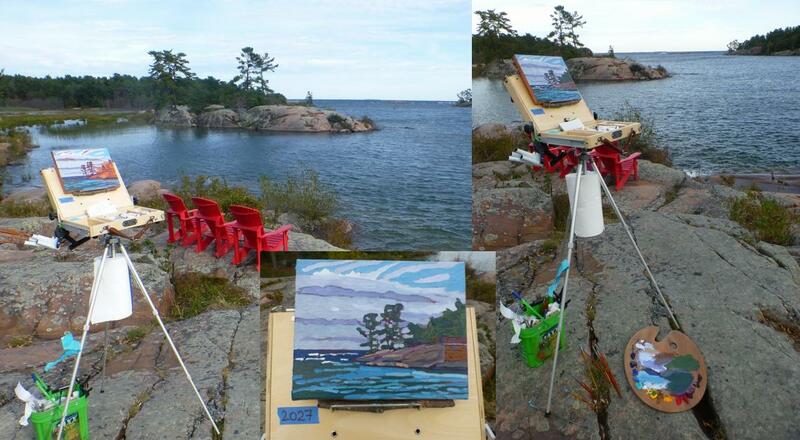 Painting outside the studio can be a challenge but it can also bring the most rewards. My goal was to be the guide and to open up a new world of art to these new adventurers, brave enough to step outside the studio. There is always something special to observe when you become fully immersed in the inspiration with nothing between you and your subject matter but your brush and your creativity. Six brave souls and Peppy the Pouch embarked for the 2017 version of the SAS Adventure with a toast to Jane Champagne. The weather and inspiration looked nearly ideal. The adventuresome group was staying at the Killarney Mountain Lodge as was the custom of Jane Champagne for the many years that she lead the Southampton Art School Plein Air Annual Adventure Course. I became friends with the owners as well, Maury and Annabelle East during the years I painted with Jane at Killarney and then after Jane passed in 2008 and I led a few of the SAS Annual Adventures myself. The Killarney Mountain Lodge was originally built in the late 1950s as a wilderness corporate resort by a large American corporation, the Fruehauf Trailer Corporation. Maury and Annabelle East bought the Killarney Mountain Lodge in 1962. Coincidentally Killarney became a provincial park in 1964, two years after the Killarney Mountain Lodge opened. To quote my friend Annabelle, 'People come here because it's a little corner that doesn't change'. New ownership had taken over from my friends Maury and Annabelle East. They sold their dream in January 2015. Maury and Annabelle wished "that it remains similar to what it is." The Easts say the new owner promises to keep the lodge in the same rustic style and tradition as they did" for 53 years. Maury and Annabelle retired to Parry Sound. Unkown to me, Maury passed away on September 10th, 2017 and following his wishes, the East family is not holding a funeral service, but held a celebration of Maury's life from 4 to 6:30 p.m. Saturday, Sept. 30 at Killarney Mountain Lodge. I arrived the next day to conduct the 2017 Southampton Art School Annual Adventure and the Canadian flag was appropriately at half mast. The plein air adventure started with a tour of the 2004 Subaru Forester Paint Mobile. One needs to travel light and fast and only include the essentials. My approach has developed over the decades and it continues to get simplified. Less is more. After a tour and a demonstration of the simple approach to plein air we set up on the southeastern edge of the Killarney Mountain Lodge. A large crane was filling in the wetland which would become the site for the planned convention centre. I did not include the crane or construction in my painting but focussed on the Chalet which was the premium accommodation in the time of Maury and Annabelle. The demonstration was meant to illustrate the approach to plein air painting. Sometimes actions are more instructive and empowering than words. The altocumulus sky was interesting and told the story of an approaching low pressure area. Deformation zones separated the two distinct cloud masses. The cloud area on the right was retreating while that on the left was advancing. The clouds always have a story to tell. This was the midday session during the third day of the Paint the Town Kingston in association with the International Plein Air Painters World Wide Paint Out. Cheryl and Jan and Debbie were painting in the neighbourhood beside the Park so I joined them. I was finished in the Kingston Marina. I do not often do pure architecture. The stark and natural reality of the raw land catches my eye. The neighbours in the house to the east came out to see what we were painting. At one time the home had been divided into maybe four or five apartments but now it had been reverted back to perhaps a single family dwelling. Every painting is another challenge. I liked the strong lighting on the east side of the home. I was painting the shadowed side of the house but it was rich in dark colours. 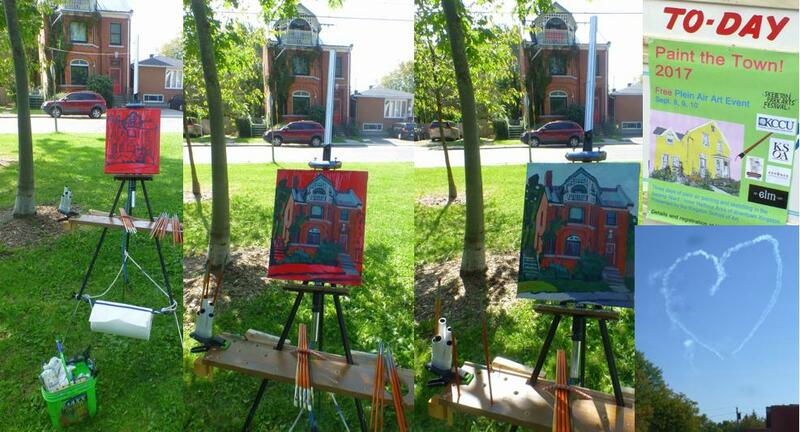 The title of the painting is the street address of the towering red brick home. This property was just a stones throw from the Kingston Memorial Centre across the park to the north. The Snow Birds started to fly again and to do their Sunday afternoon performance. This was the morning of the third day of the Paint the Town Kingston in association with the International Plein Air Painters World Wide Paint Out. An American bittern joined me while I painted. The bird gradually shuffled down the dock. This was a rare encounter. Bitterns are typically very elusive. The bittern appeared to be hunting for breakfast but I never saw it lunge at anything. Perhaps this solitary bittern had become a city dweller. This unusual boat looked a bit like a tug. Old tires were draped off its hull everywhere so it must be accustomed to bumping into things. It might have been used as a diving platform as well. I liked the colours in the morning light and that is what attracted me to this subject matter. The bittern is streaky, brown and buff heron that can materialize among the reeds, and disappear as quickly, especially when striking a concealment pose with neck stretched and bill pointed skyward. These stealthy carnivores stand motionless amid tall marsh vegetation, or patiently stalk fish, frogs, and insects. They are at their most noticeable in spring, when the marshes resound with their odd booming calls that sounds like the gulps of a thirsty giant. They have shorter legs and thicker necks than typical herons and a slightly hunched posture. The dagger like bill is long, straight, and sharply pointed. The wings are broad but the wingtips are somewhat pointed. They tend to forage alone - like I tend to paint alone. This was the sunrise of the third day of the Paint the Town Kingston in association with the International Plein Air Painters World Wide Paint Out. The sun had just cleared the Thousand Islands and the shadows were very long indeed. This time I imagined that the tug was undercover and thus incognito - as having one's true identity concealed - a James Bond and Ian Fleming spy tug. This could certainly be true as there must be a good story behind a boat that looked as liked this one as though it had been through the wars. No one I spoke to could either knew or could divulge the story. This was late afternoon of the second day of the Paint the Town Kingston in association with the International Plein Air Painters World Wide Paint Out. I strolled in the main yard of the Kingston Marina. I asked Robert who seemed to be in charge of operations if I could paint from the dock. He was very obliging so I did so. The old tugboat across the small bay did not display any visible name. I asked but no one seemed to know the story behind this particular tug. It needed some work but it certainly still floated. A couple of ladies strolled by and asked if I painted mermaids... I can't make this stuff up. There were some buildings and another boat in behind the old tugboat but a sudden fog came in and removed them from the composition... The other structures did not add to the painting so they got removed. I am just making the sudden fog story up. It was a fair weather cumulus September afternoon and any type of fog was a meteorological impossibility. 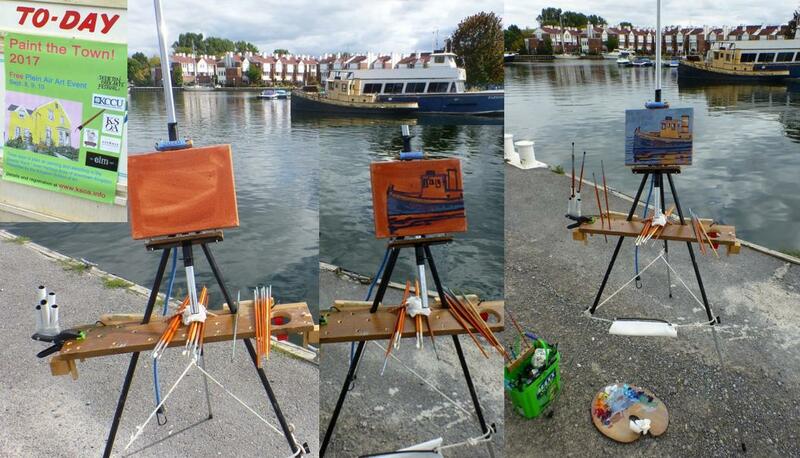 This was early afternoon of the second day of the Paint the Town Kingston in association with the International Plein Air Painters World Wide Paint Out. After completing #2018 "Historic Woolen Mill" I returned to the shade of a tree overlooking the large buildings of the Kingston Marina. The title of this painting is the street address for the Kingston Marina. A flock of sea gulls virtually lived on the roof of the large building. The gulls were there on the roof at dawn and still in place at the end of the day. They never seemed to move although they must have flown off to feed. I was able to get this westward looking view painted before the sun got too low in the afternoon sky which would have made if challenging to see. 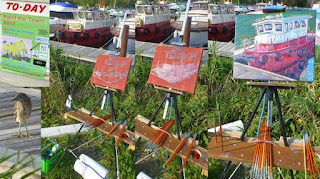 The stern of the sail boat "God Speed" also made it into this painting. The building was in pretty rough shaped. I can imagine the large crane and moving trucks banging into the metal walls from time to time. Barry the kayak-er camped overnight at the boat ramp. We carried on an ongoing conversation as I painted. He had paddled down the Trent Waterway to Trenton and after paddling eastward along the Lake Ontario shore, he was headed up the Rideau to Ottawa. He was only headed as far as Kingston Mills to spend the night. After he bought new shoes, I helped him launch his kayak. We both stayed dry during the process. This was late morning of the second day of the Paint the Town Kingston in association with the International Plein Air Painters World Wide Paint Out. After completing #2017 "God Speed" I headed 50 feet to the north and the shoreline of the large bay that stretched south from the shores of the Woolen Mill. This provided a long range look at the historic building. The humm of the car tires travelling over the steel bridge of La Salle Causeway carried across the water and provided the sound track to the painting. The Woolen Mill was declared an historic building on May 12, 1987. The elevated stable layer of an approaching warm from was revealed by the flat and grey bands of altostratus in the northern sky. More weather was on the way. The Woolen Mill is a 19th-century building, and such structures were built to last. This four-storey red brick building was constructed in 1882 when a group of Kingston businessmen needed a place in which they could produce cloth. The building was erected on 'Farm Lot A' on a bank of the Cataraqui River known as the 'Inner Harbour'. It functioned as a cotton mill for the Kingston Cotton Manufacturing Company for about 50 years. The City of Kingston purchased the property in the dirty thirties with the intention to run it as a woolen mill under lease to the Hield Bros. of England. The mill thrived through and beyond the depression and the war. It wasn't until 1966 when synthetic fabrics gained momentum that the mill closed. Three years later St. Francis Developments took over and the building began undergoing renovations to divide the open-concept building into office spaces for multiple businesses. 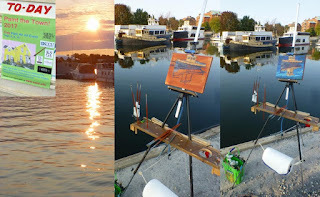 This was the sunrise of the second day of the Paint the Town Kingston in association with the International Plein Air Painters World Wide Paint Out. 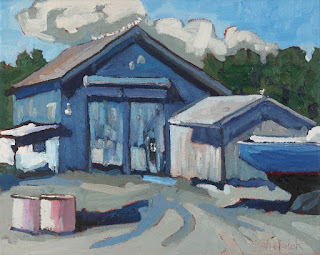 I headed back to the Kingston Marina and a composition I had scouted the previous afternoon. I positioned myself looking at the God Speed with the rising sun on my back. This boat needed the strong, front lighting of a early morning sun. The blue boat had a small cross in its name. I sunk the aluminum skiff that was parked in front of God Speed. That aluminum skiff didn't add anything to the composition and plus it that hid some of the supporting timbers. I did include the steel hull of a larger boat that was parked behind the God Speed. The sun felt really good on my back and there were no biting insects. The term "God Speed" originates from 1250 to -1300 and the Middle English phrase God spede which meant "may God prosper (you)" or “may God cause you to succeed”. Another reference traced the roots of the phrase further back to Old English spēdan (to prosper) and from spēd for success. The phrase was used to wish someone success or good fortune. The term is particularly appropriate for those on a journey. The phrase means the same as farewell, goodbye and good luck. 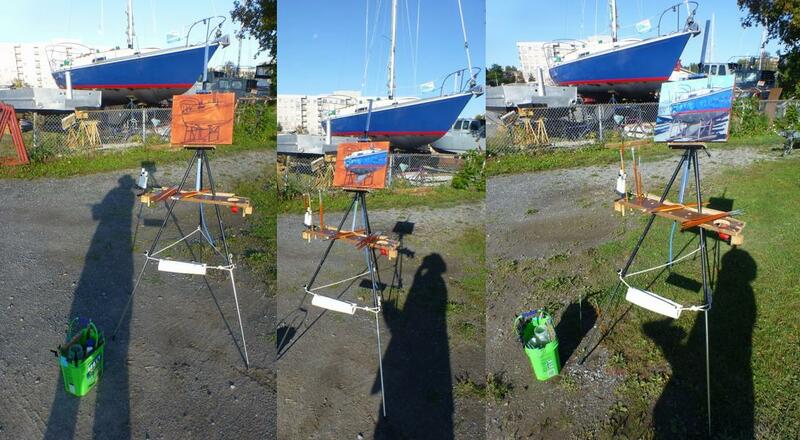 I liked the name of this sailing boat as much as I enjoyed the blue lines and intense colour in the morning light.